The next open house at the Bohart Museum of Entomology, located in Room 1124 of the Academic Surge Building on Crocker Lane, UC Davis campus, is set for 1 to 4 p.m., Sunday, Nov. 18. It's free and family friendly. 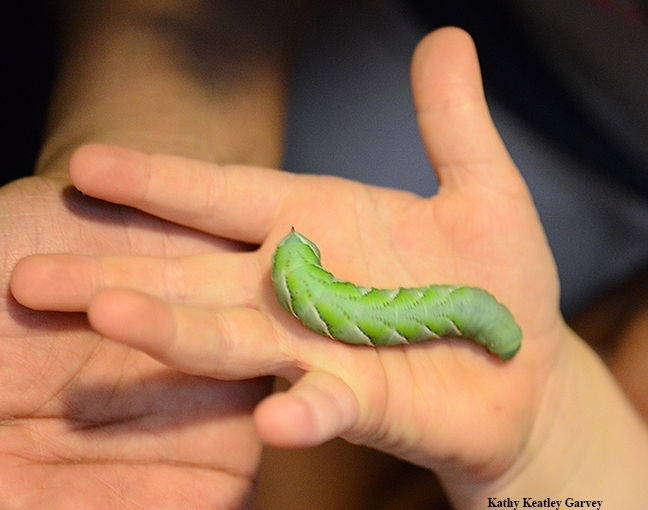 "The focus is urban entomology," said director Lynn Kimsey, UC Davis professor of entomology. "We'll have out examples of all the wonderful household pests/friends and garden pests, along with the kinds of things they inspect restaurants for." 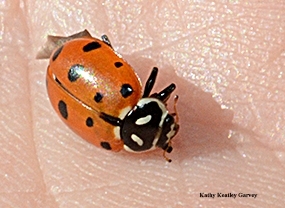 Think of such beneficial insects in the garden as lady beetles (lady bugs) and praying mantids, and such pests as cockroaches and booklice in homes and restaurants. What are booklice? 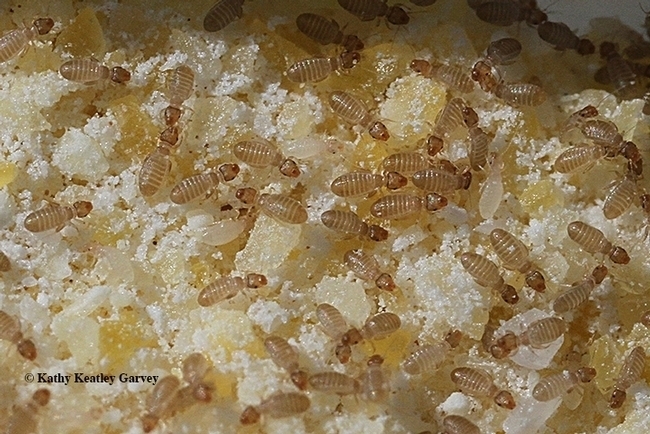 These nearly microscopic insects, Liposcelis bostrychophila, or "psocids" (pronounced "so kids"), are common pests in stored grains. 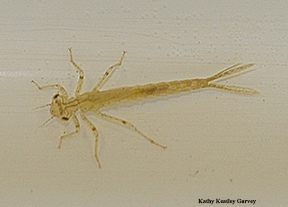 They're usually unseen because they're about a millimeter long--about the size of a speck of dust--and are transparent to light brown in color. 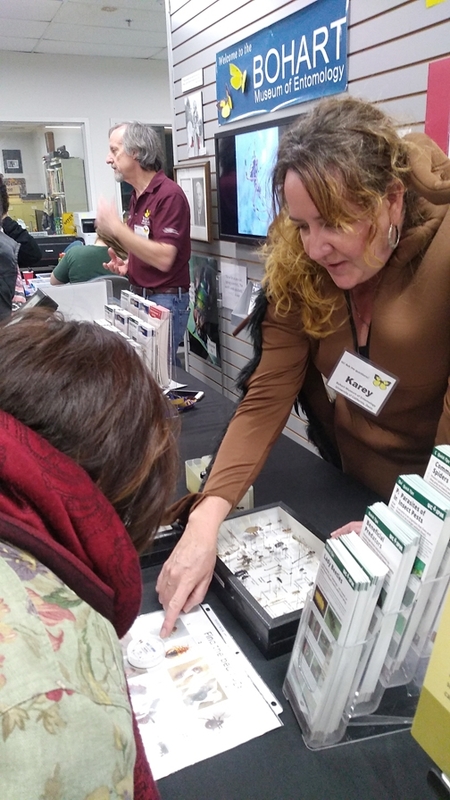 At the open house, look for scores of displays dealing with urban entomology. 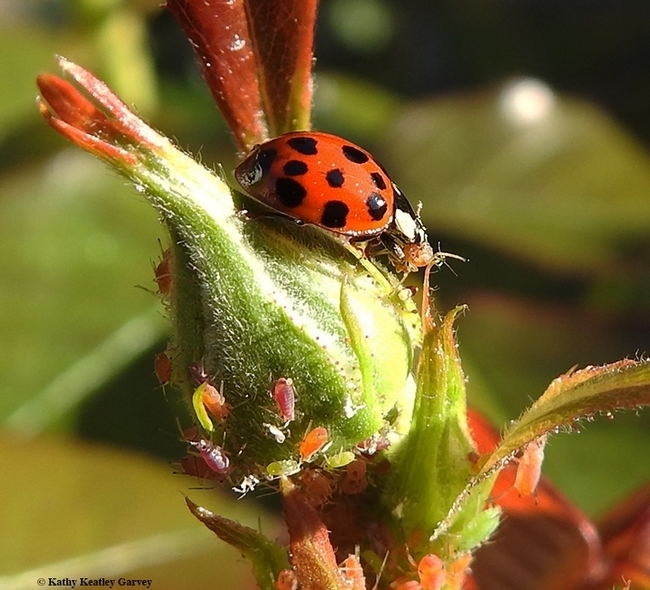 The UC Statewide Integrated Pest Management Program (UC IPM) will take part. A family arts and crafts activity is also planned. The Bohart Museum, home of nearly eight million insect specimens, is the seventh largest insect collection in North America and houses the California Insect Survey, a storehouse of insect biodiversity. 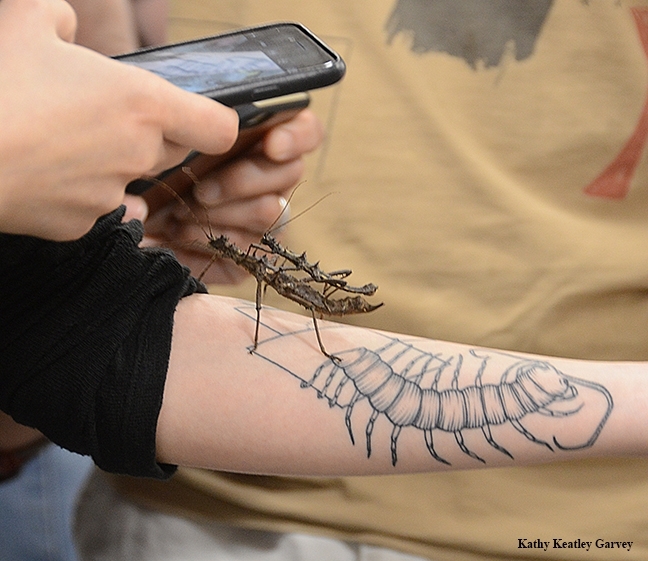 In addition, the Bohart features a live "petting zoo," comprised of Madagascar hissing cockroaches, walking sticks, tarantulas and praying mantids; and a year-around gift shop, which is stocked with T-shirts, sweatshirts, books, jewelry, posters, insect-collecting equipment and insect-themed candy. 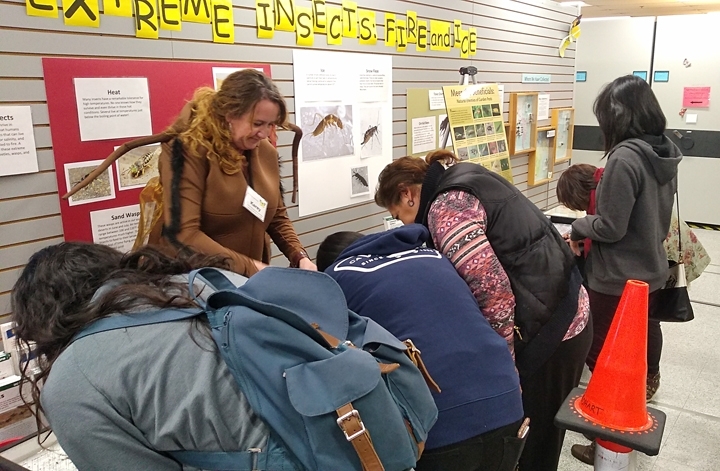 Sunday, Nov. 18, from 1 to 4 p.m.: "Bring It Home: Urban Entomology"
The Bohart Museum's regular hours are from 9 a.m. to noon and 1 to 5 p.m. Mondays through Thursdays. It is closed to the public on Fridays, Saturdays and Sundays and on major holidays. Admission is free. More information on the Bohart Museum is available on the website or by contacting (530) 752-0493 or emailing bmuseum@ucdavis.edu. 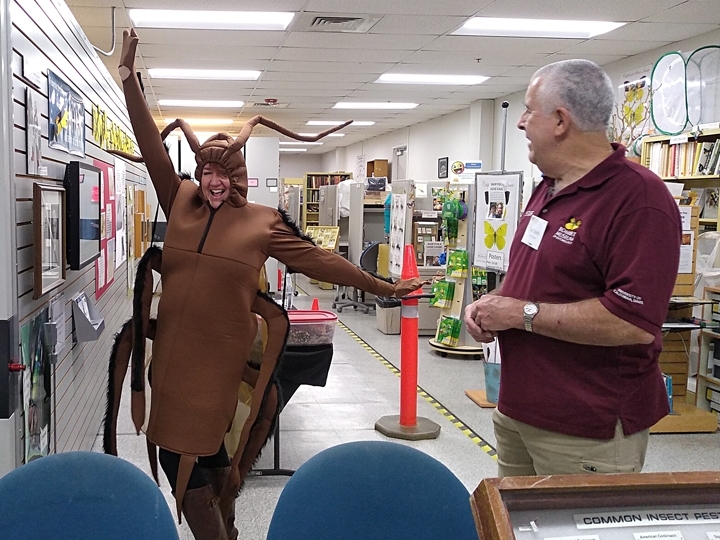 If you poked around all the bug exhibits during the campuswide UC Davis Picnic Day on Saturday, April 16, you probably came away thinking: Bugs rule. In sheer numbers, diversity and special honors. 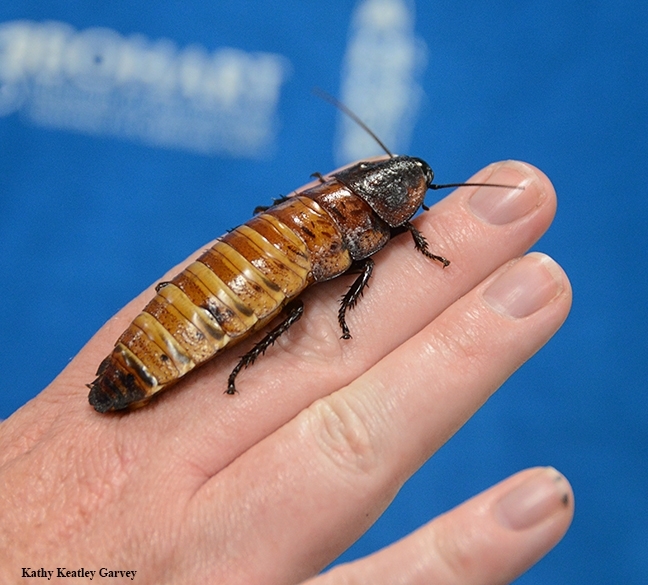 The Bohart Museum of Entomology, home of nearly eight million insect specimens, won a special honor for its display, "Real Insects and Their Mimics." It won the people's vote for the best "Family Friendly" exhibit. The display included look-a-like butterflies, meant to confuse predators, and honey bees and flies (drone flies), meant to confuse editors! Yes, bugs ruled at Briggs and the Bohart. Briggs Hall included maggot art (dip a maggot in water-based paint and let it crawl on a white piece of paper); cockroach races (root for your favorite cockroach), the pollinator pavilion (count the live butterflies and bees); taste honey (yes, pine "honey" isn't honey but it drew a lot of attention), Dr. Death (staffed by forensic entomologist Bob Kimsey); Bug Doctor (headed by graduate student Ralph Washington Jr.); mosquitoes (molecular biologist Shirley Luckhart and her students, and the Sacramento-Yolo Mosquito Control District staff), and the UC Statewide Integrated Pest Management display (lady beetle give-away, and information about the "IPM way" to control pests). Then there were the displays of ants and forest insects, the bee observation hive, and insect-collecting equipment. You could get a butterfly painted on your face while you ate a cricket-flour cookie, after you bought a t-shirt emblazoned with "The Beetles." 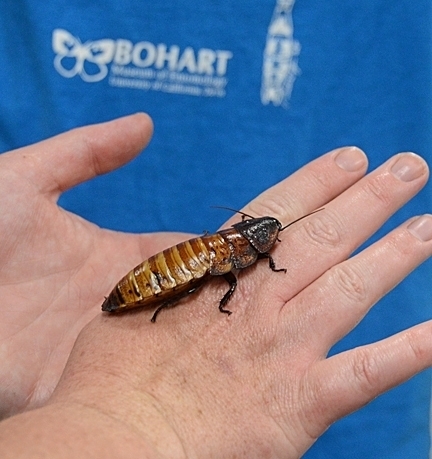 At the Bohart, you could examine specimens, hold walking sticks and Madagascar hissing cockroach, touch the "teddy bear" (male Valley carpenter bee) and buy assorted gifts at the gift shop. This was the 102nd annual Picnic Day, offering thousands of visitors informative, educational and entertaining displays. A century ago, the Department of Entomology did not exist. The first insects, however, existed more than 400 million years ago. Probably more. The world's oldest known insect fossil is 400 million years old, according to findings published Feb. 12, 2004 in the journal Nature. She said so at her presentation Wednesday night, Jan. 7, at UC Davis. 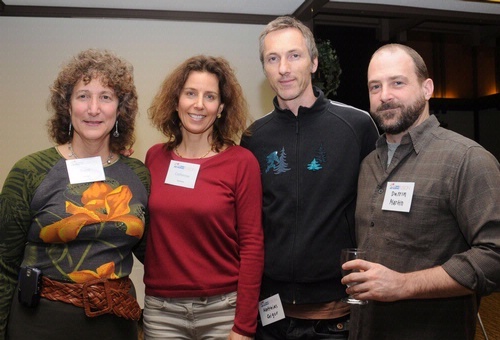 The occasion: “The Consilience of Art and Science centennial colloquium, sponsored by the UC Davis Art/Science Fusion experimental learning program. But as a multi-media artist (video, photography, sculpture and drawing), Chalmers wants people to know that insects, including cockroaches, are part of the planet, whether we like them or not. “If all the insects disappeared, our ecosystem would crash within a matter of months,” she said. The New York-based artist worked with cockroaches for 10 years. She reared them. She posed them climbing, running, eating, mating and laying eggs. She “executed” them in the gas chamber, in the electric chair, burned them at the stake, and hung them. But not really. No animals were harmed in the making of her art. 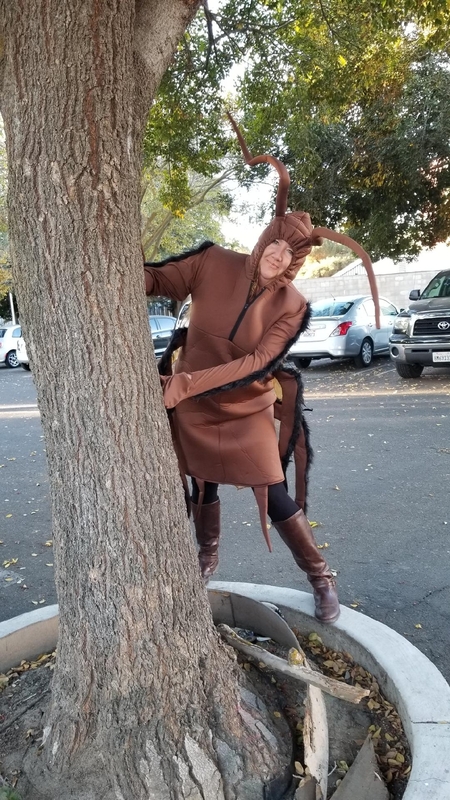 The burned-at-the-stake cockroach? 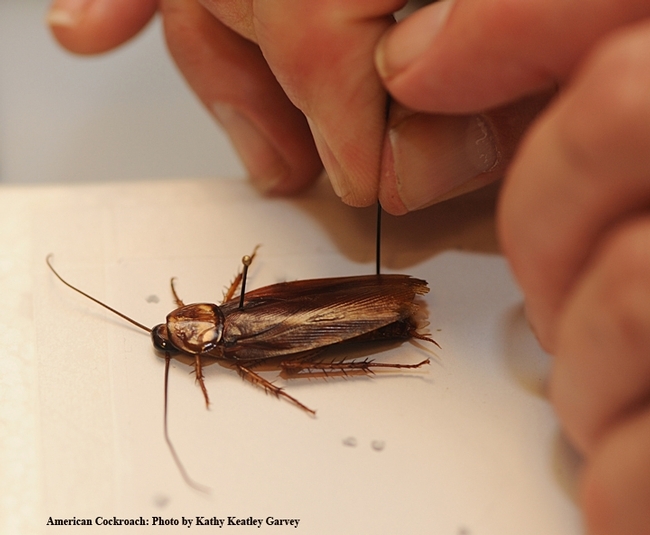 The flames were real, but the cockroach strapped to the stake was reacting to an air current. The one engulfed in flames was a dead body. It had earlier died a natural death, she said. She drew gasps from the audience when she showed a roach “trophy head," much like a hunter's deer trophy. Laughter erupted when a roach climbed the stem of a wine glass and then toppled into the wine. The American cockroach is not from America. Its origin is in Africa, like us. The cockroach followed us as we colonized the planet. It’s not to be found in the wild anymore; it lives in our homes. The transformation from juvenile to adult--the molting stage--is beautiful. The female cockroach mates once and is pregnant for life. She's very particular about which male she chooses. Hatching is difficult to see. We had 180 egg cases in the nursery (a room she created). I saw only one hatching. "I worked with cockroaches for 10 years, which was probably 10 years too long," Chalmers quipped. So, what did she learn about roaches in those 10 years? 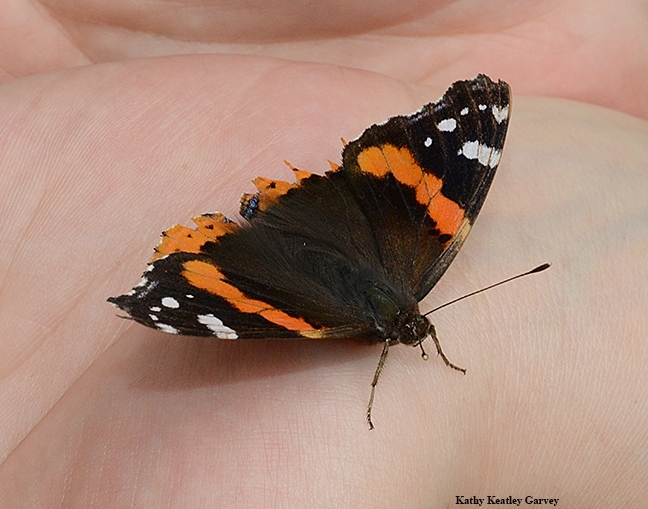 She gained a deeper appreciation and respect for the insects. "But if my home were infested, if the cockroaches were not caged, I'd be the first to call the exterminator." 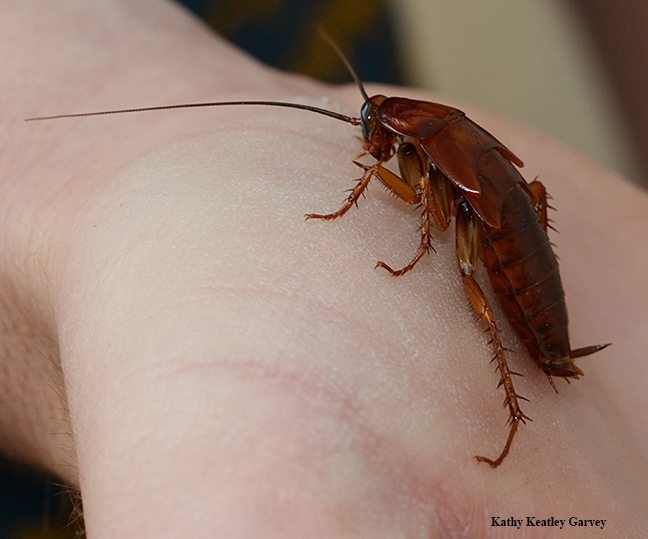 The real reason why people hate roaches? "Because they invade our space," she said, "and we can't control them." "The more we throw at them, the more they come back." Still, Chalmers said she'd much rather encounter a cockroach than a grizzly bear. One of her vidoes shows roaches swarming over a teddy bear in a nursery, a scene that prompted a "Yecch!" chorus. Her next project? Leafcutter ants. Her newly created video, "We Rule," shows leafcutter ants cutting leaves and carrying them back to their nests. To add humor, she filmed them carrying leaves she'd previously shaped into letters of the alphabet. One ant scurries across the screen carrying an "A," another a "B," and another, a "C."
Next stop: Costa Rica, where Chalmers will continue to work with leafcutter ants in her multi-media art. "I'm done with cockroaches," she said. Note: Check out her work on her Web site at www.catherinechalmers.com. You'll see the insect we love to hate--and perhaps gain a deeper appreciation and respect for it.